This comprehensive but accessible handbook is for the average coffee lover who wants to make better coffee at home. Unlike other coffee books, this one focuses exclusively on coffee--not espresso--and explores multiple pour-over, immersion, and cold-brew techniques on 10 different devices. Thanks to a small but growing number of dedicated farmers, importers, roasters, and baristas, coffee quality is at an all-time high. But for nonprofessionals, achieving caf quality at home can seem out of reach. With dozens of equipment options, conflicting information on how to use that equipment, and an industry language that, at times, doesn't seem made for the rest of us, it can be difficult to know where to begin. 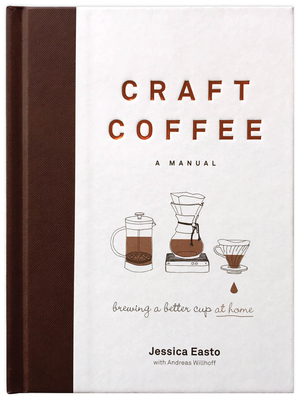 Craft Coffee: A Manual, written by a coffee enthusiast for coffee enthusiasts, is a comprehensive guide to improving your brew at home. The book provides all the information readers need to discover what they like in a cup of specialty coffee--and how to replicate the perfect cup day after day. From the science of extraction and brewing techniques to choosing equipment and deciphering coffee bags, Craft Coffee focuses on the issues--cost, time, taste, and accessibility--that home coffee brewers negotiate and shows that no matter where you are in your coffee journey, you can make a great cup at home. Jessica Easto received a degree in journalism from the University of Tennessee and an MFA in creative writing from Southern Illinois University. Her writing has appeared in the Chicago Tribune, Gapers Block, and more. She has been brewing craft coffee at home for more than eight years. Andreas Willhoff is the director of education at Halfwit Coffee Roasters and the director of operations at The Wormhole, a Chicago craft coffee shop that has been recognized by Food & Wine, Sprudge.com, Fresh Cup, and CNN.com, among other places.